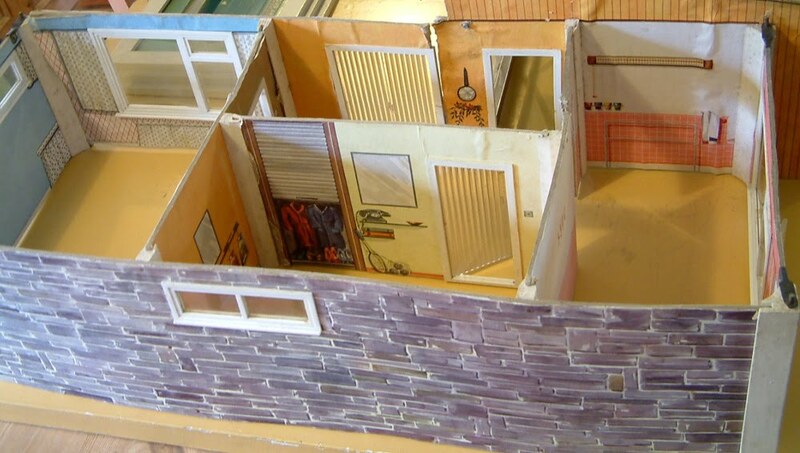 For fans and collectors of Tri-ang and particularly the retro 1960's style houses, I am pleased to announce that coming very shortly to KT Miniatures is the rare Tri-ang Bungalow "C"....the largest of the three versions manufactured by Tri-ang in the 1960's. It consists of seven rooms and is constructed out of wood, printed board and plastic. 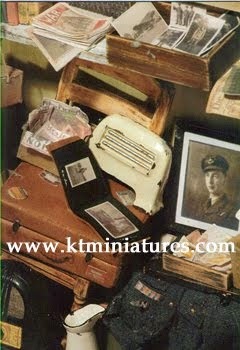 Now that I have been able to inspect this model close up, I can understand why it is so rare. The construction and materials used are decidedly fragile. The cardboard walls particuarly and on my example I have here (that is just about to go up for sale) at least two of the walls have torn above the doorway and will need taping. 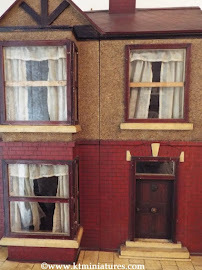 Plus several of the doors have lost their tiny plastic nibs so are not able to stay in place on their own, however this should not be too much of a problem for the collector as they are all still present and can be fixed into place via gripwax or bluetac. The board walls are delightfully decorated in bright coloured images. The construction slots into place via wooden grooved fittings and nuts/bolts are including to fix down to base and to each other. The very pretty pastel green wooden roof slots into place. I love the wooden and plastic pond in the outside area, plus there is a car port and plenty of scope for garden items too. 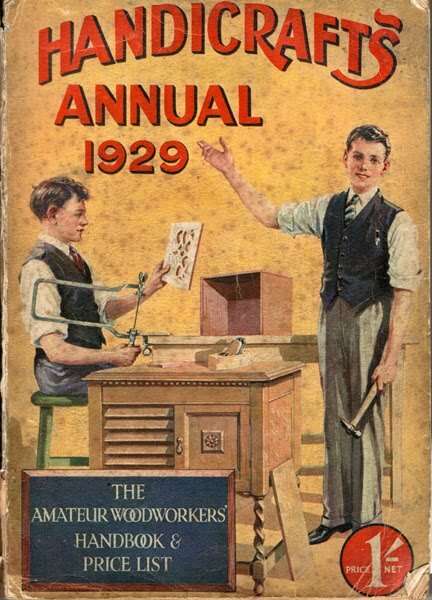 Further to the earlier feature on the Handicrafts Annual 1929, I have received a number of interesting emails on the subject, (thank you everyone who sent in your info). 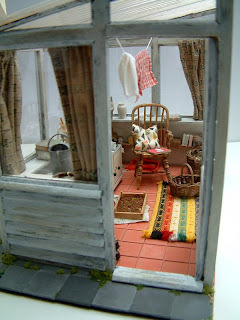 However I just had to show you all this image of a vintage house sent in by a lady from Oxfordshire, based on one of the Artistic Houses, Design No. 325. 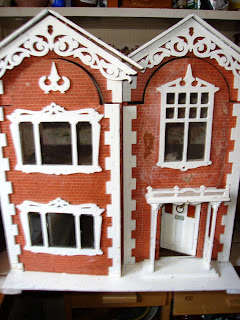 Thank you Susanne for your kind permission to show this image of your lovely house. 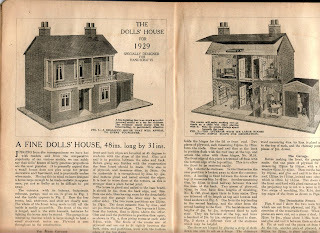 As with all these vintage dolls houses that were made from purchased plans and components, the actual quality of the workmanship differs greatly due to the level of skill of each maker. 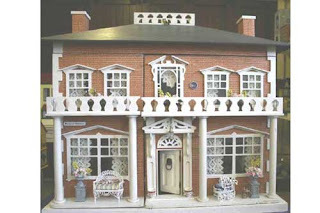 Even so, some that were constructed by amateur craftsmen were simply wonderful and Susanne's dolls house is exquisite; the fretwork just beautiful. 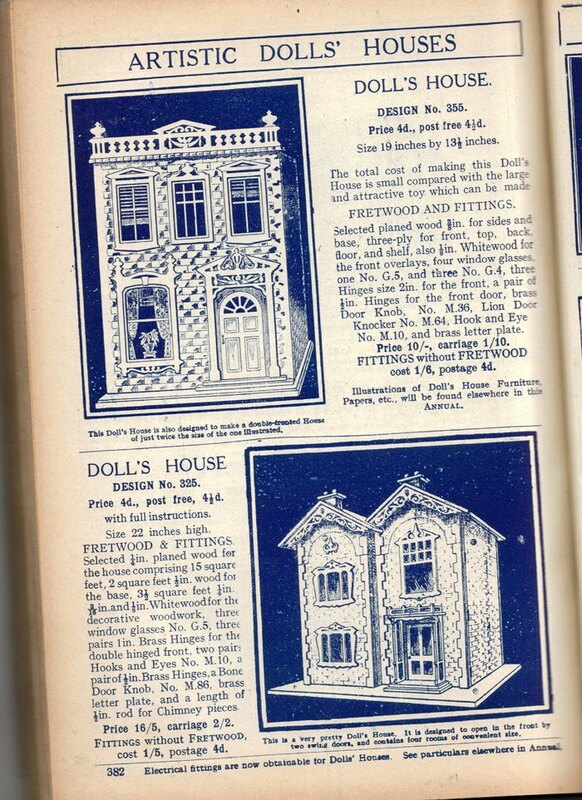 Thank you to Susanne for pointing out an article on Handicrafts Houses headed "Fretwork Marches On" in the Spring 1978 Issue of International Dolls' House News magazine (pages 6-7), written by Margaret Towner. 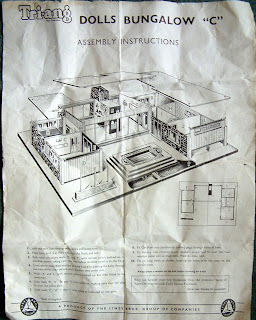 Margaret in her article says that the plans of No. 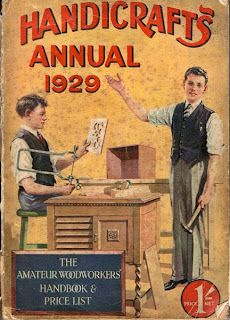 325 appeared in 1919 and interestingly that the No. 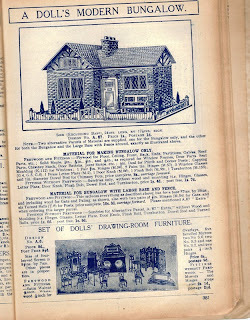 A58 Design (see previous feature on Handicrafts) was issued as a free supplement in the 1923 Handicrafts Annual. 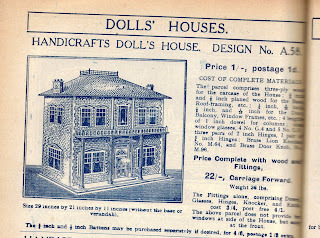 As I suspected, the article states that once Handicrafts published a design, then that design was available for many years, which could make precise dating of your Handicrafts House a little more complicated. 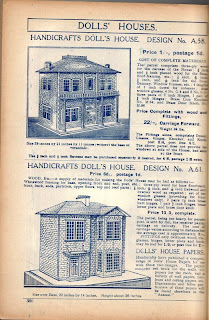 I have been lucky enough to get hold of a 1929 Handicrafts Annual and inside are several references to dolls house plans. 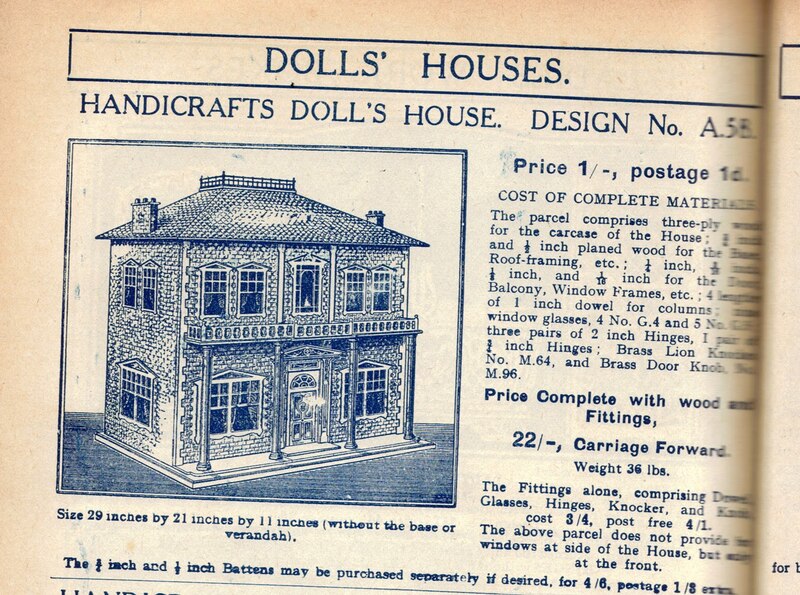 It appears that like Hobbies, Handicrafts sold plans and components of dolls houses for their readers to purchase. Now one classic design that I have seen on a few occasions is the one that is referred to as No. A58 (see above) . 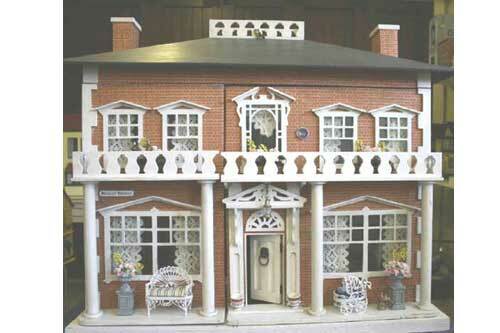 In fact, tucked away in Collection 4 on our Old Dolls House Gallery Page, there is a lovely house belonging to Barbara Kendall-Davies which Barbara refers to as the “Fretsaw House”. 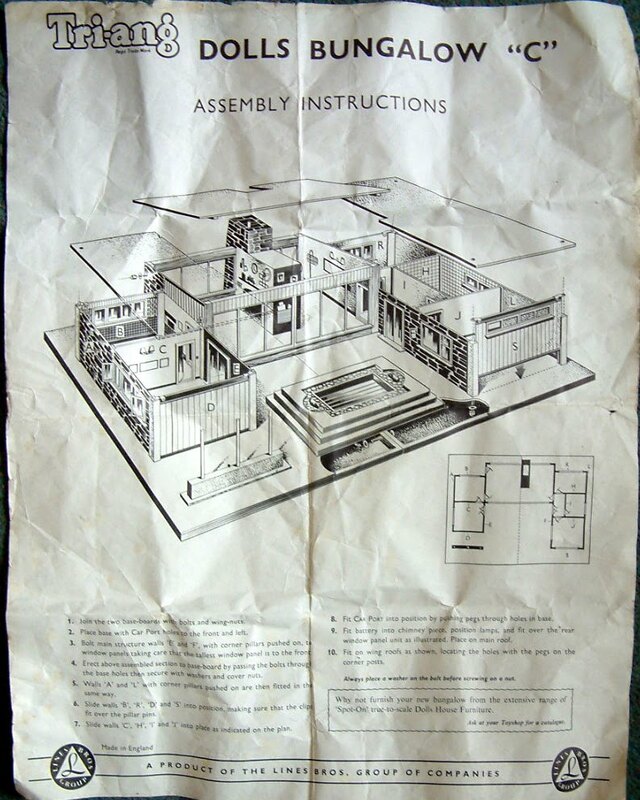 Barbara tells me that her house is practically identical to the one in the plans but the difference being that hers does not have side windows. 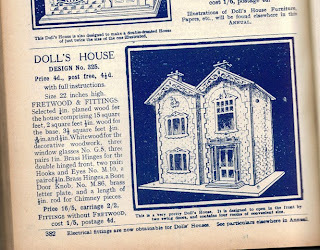 Now that is interesting, as the advert states that “the above parcel does not provide windows at the side of the House, only at the front.” Therefore presumably, as the advert clearly shows the house having side windows, one must have been able to purchase the side windows separately? 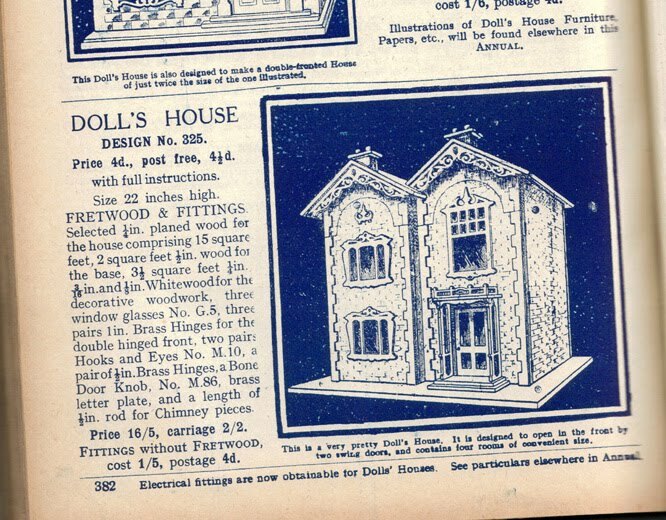 The reference number of this house (A58) seems to suggest that this had been available for a long time, as several of the reference numbers of other houses advertised in this same annual runs into treble figures. 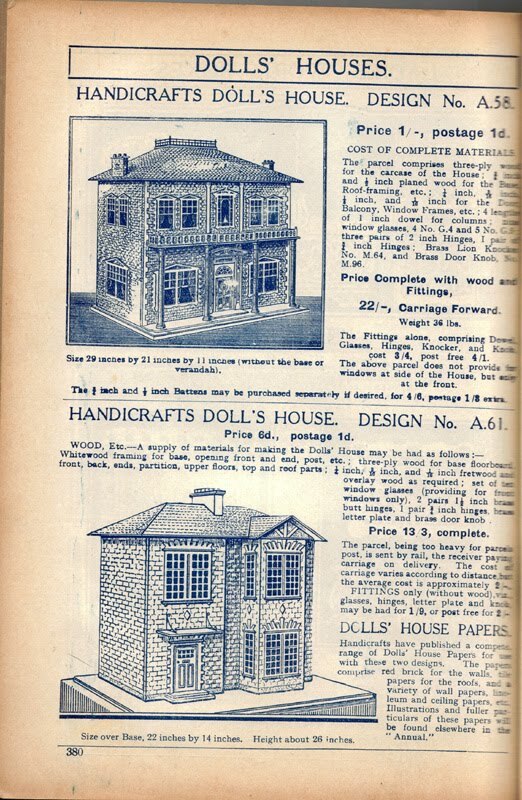 Instructions on how to make this 1929 dolls house that is “Specially Designed For Handicrafts” is given over 5 pages of this same annual. 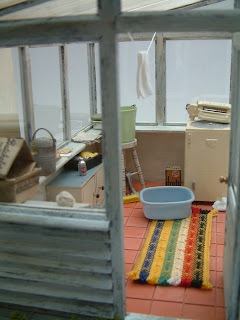 I love the detail of the furnishings. I wonder if anyone actually has this house? 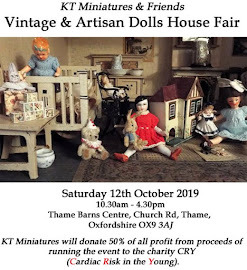 Do please get in touch if you do, as I would love to see a photo of it! Other plans advertised (with accompanying materials & components) are for a"Modern Bungalow" plus a whole set of "Drawing Room Furniture". 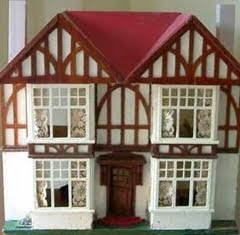 Then on a following page curiously are two houses that come under an "Artistic Dolls Houses" banner! I definitely have seen Design 325 on a number of occasions over the years but sadly have no photos. 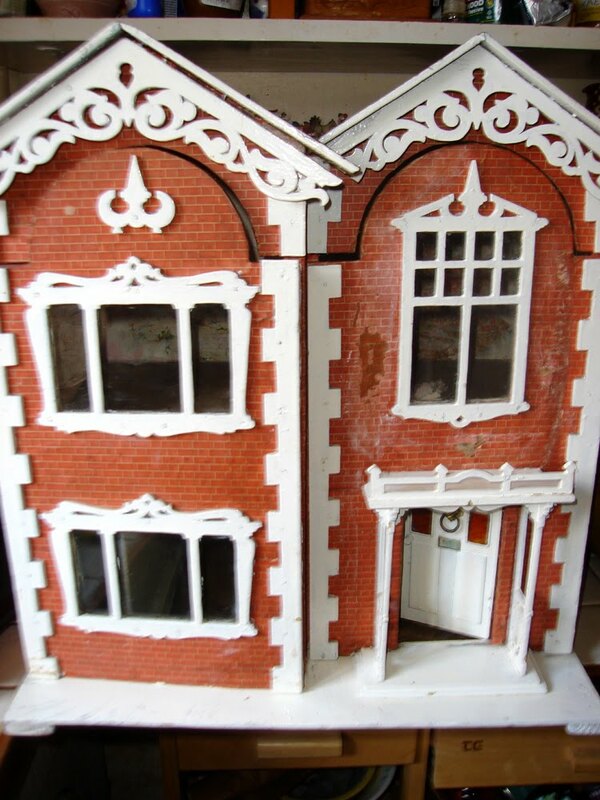 So again, if anyone has any of these houses in their possession, I would love to hear from you. 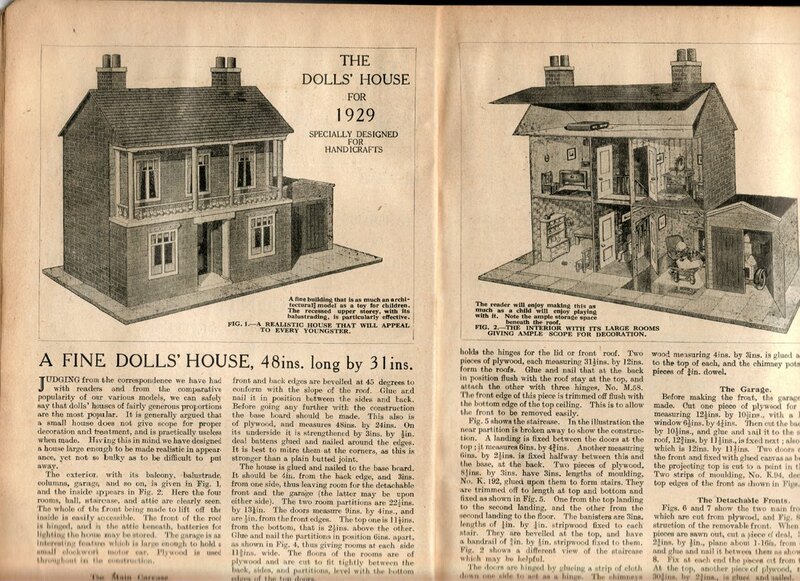 Also in this annual, there are components and wallpaper for dolls houses advertised for sale and I will show images of these at sometime in the near future on here. Hope you have enjoyed this little peek into the past. 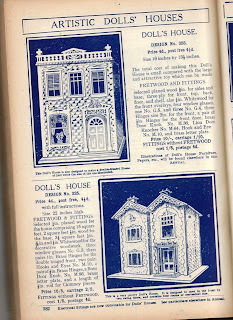 Personally I find these old annuals and handbooks absolutely fascinating, not just for the dolls houses but for the designs of ordinary daily items and the not so ordinary! It gives us a snapshot in time on past trends.